The show will be held in association with Jupiter Financial Center and the International Marketplace Connection (IMP Connection) and is expected to attract up to 150 vendors and 2,000 participants at the event. The show is open to wholesalers as well as retailers. We are strategically inviting over 200 churches, pastors, leaders and administrators. The Business Expo brings together hundreds of businesses, entrepreneurs, churches and ministries to network and promote their goods and services. The Expo will attract businesses from China, Canada, The Netherlands, the Caribbean and various States. The Business Expo and Conference will be opened on Saturday, April 6th from 10am-5pm. Under the Theme: Rejuvenating Your Passion for the Marketplace the show promises to be a very rewarding experience. Through our special Business Match-making programs various companies will also be given the advantage to have business-to-business meetings with potential partners, where they can initiate, develop or complete deals. Some of the Trade Show Activities include: Exhibits, Free Life Changing Seminars, Sales & Marketing Workshops, Social Media Workshops, Business Development, Fundraising Opportunities, Networking Events, Investment Seminar, Financial Planning Workshops, Live Entertainment, Health and Wellness Expo and much more. The Life Changing Seminars and Workshops are practical, illuminating, and innovative. New City Players is bringing the community together for an evening of storytelling, truth speaking and listening. Unfiltered and uncensored, City Speaks allows the people of Fort Lauderdale to speak their minds and be heard. Take a seat and enjoy free live music every Friday at The Falls in Center Court. Musicians from South Florida will play a contemporary mix of jazz, latin, funk, and more! Lips, the ultimate in drag dining, will host a not-your-ordinary Holiday Toy Drive to benefit Children’s Diagnostic & Treatment Center (CDTC) during its Dragalicious Gospel Brunch on Sunday, December 9, with two show seatings at 11 a.m. and 1:30 p.m. Attendees are encouraged to bring an unwrapped children’s toy to receive a free Lips’ world famous frozen cosmo during a future visit. Attendees to this festive brunch will have two reasons to enjoy this foot-stomping, high-energy event. One is to celebrate Lips’ show hostess, Nicolette’s birthday and the other is to support CDTC. Show goers will experience soulful and inspirational music performed by the ladies of Lips who will also serve Lips’ world-famous Sunday brunch with bottomless Bloody Marys, mimosas and Champagne. A $10 cover charge in addition to brunch will apply to each attendee and go directly to Children’s Diagnostic and Treatment Center. The Moth is dedicated to finding intriguing people to tell inspired stories. At The Moth StorySLAM, those people find us. On this night, using words as weapons, they compete to determine The Moth Miami GrandSLAM Story Champion! Prepare to seduce your inner darkness as Erika Moon Productions whisks you away to a world of shadows and desires. 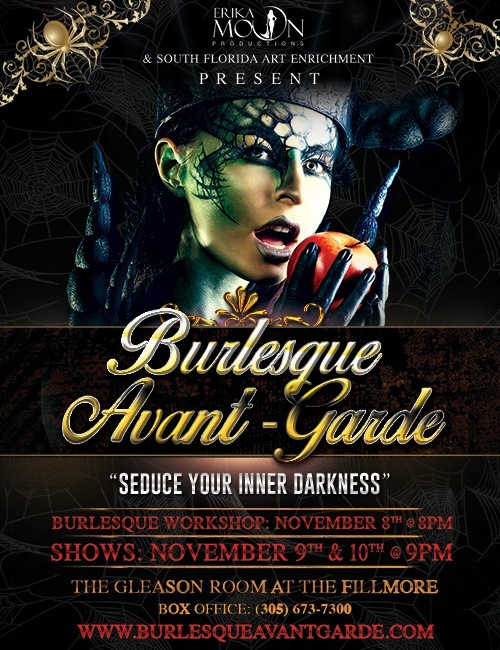 Burlesque Avant-Garde will chill and excite you by bringing the alluring dark side of sophisticated burlesque alive! Our exclusive cast presents a powerful, glamorous, and mystical fantasy to Miami Beach in a way no one has before. This post-Halloween fall event will feature edgy jaw-dropping acts, while tempting the audience with dazzling costumes, and amazing performers! It’s no surprise that Erika Moon, the groundbreaking producer of European classic cabaret shows here in South Florida, was recently heralded as one of the best-known producers in South Florida by Miami New Times. While Burlesque Avant-Garde is an “out of the box” concept for Erika Moon compared to her other events, her dedication to entertainment and production value shines brightly with this exciting theme. Burlesque Avant-Garde is a step away from the “burlesque norm” of glittering glamour and is instead an indulgence of the shadowy world that will drive the audience wild. It’s sure to leave everyone begging for more! Be sure to dress to impress for this spectacular event, as you might have an opportunity to be part of the show! As an extra treat, join us on Thursday, November 8th, for a very special burlesque workshop that will teach you some of the seductive tricks of the trade! Join us on Thursday, November 8th, for a very special burlesque workshop that will teach you some of the seductive tricks of the trade! This is a limited engagement with only 20 spots available, so get your tickets fast! From timeless ashes emerge new beginnings at Faena Theater with SAMSARA CABARET, a new original Faena LIVE production in collaboration with Quixotic, debuting October 2018 at Faena Miami Beach. Inspired by the Sanskrit word “samsara” referencing rebirth, karmic reincarnation and life’s constant change, Samsara Cabaret fuses stunning visuals, contemporary dance, cirque nouveau, live music, state-of-the-art technology, fire performance and more to create an exhilarating theater experience unlike any other. Narrated by Faena Theater’s Goddess of Experience through a series of lively vignettes, Samsara Cabaret tells the transformative journey of Artemis, a being made of stardust, as she confronts the light and dark energy that surrounds her. Transcending her own dimension, the show’s lead protagonist, played by Miami native Bianca Allanic, undergoes a startling metamorphosis right before the audience’s eyes through song, dance, acrobatics, optical illusions and beyond. Samsara Cabaret boasts an outstanding ensemble of award-winning talent, including powerhouse singer and “America’s Got Talent” semi-finalist Yoli Mayor, violinist Shane Borth, cellist Ben Munoz, and Sensatia stars Megan Stockman, EnVee and Samanta Mixan. The incandescent performance, directed by Quixotic’s Anthony Magliano and Christian Squires, is a sensuous meditation on the eternal cycle of creation and transformation, during which guests are siren-called to leave their old selves behind in search for the ever-new. Shows on Thursday, Friday and Saturdays at 9:00 pm. Dinner Shows on Fridays & Saturdays at 8:00 pm (Show at 9:00 pm). Doors open 60 minutes prior to Dinner Show guests and 30 minutes prior to all guests. Guests ages 18 and older welcome. Tickets begin at $55 and are available at www.faenatheater.com and www.Ticketmaster.com. Available on Friday and Saturday nights, these prix fixe menus offer an array of mouthwatering dishes to appease every palette. Each Dinner Show ticket also includes two glasses of wine or prosecco from a select menu. Dinner is served from 8:00-9:00 p.m. Doors open at 7:30 p.m. to dinner guests. Celebrate the opening of Grids: A Selection of Paintings by Lynne Golob Gelfman with a walk through of the exhibition with artist Lynne Golob Gelfman and PAMM Chief Curator Tobias Ostrander. Following the walk through join us for a toast to the artist on the Joy Terrace with complimentary bites and beverages. The Progressive Insurance Miami International Boat Show is back for it’s 78th year, once again docking at Miami Marine Stadium Park & Basin February 14-18, 2019. Boating and sailing enthusiasts from around the globe will gather for the five biggest days in boating on an island oasis with expansive views of Biscayne Bay and the Miami skyline. The 2019 Show promises a boat show experience unlike any other, complete with the best of the best in boating and sailing, along with special guest-experiences including a VIP lounge, top of the line food & beverage options, demo docks, products & innovation, and more! For more information on the 2019 Miami International Boat Show, visit www.MiamiBoatShow.com. Join us Sunday August 5th for R House’s Sunday Drag Brunch! It’s the best drag show in town and an incredibly popular Sunday Funday hotspot. Sip bottomless mimosas, watch our queens perform all brunch long, and jam to all your favorite music courtesy of DJ Jody McDonald! MTO Live: Comedy Meets Crank: Close the weekend with “Comedy and Crank” at this Grand Finale event. This years all star line up will have you laughing out of your chair ! The Eddie Bryant Comedy Classic, featuring Comedians Tight Mike and Sean Larkins seen on HBO, Comedy After Dark, & BET ComicView. After the show it’s an after party of epic proportions! Along with hot boy Dee Jay Casper on the 1s & 2s Witness live performances by Black Passion Band and the break out band of the year on their world tour Black Alley !